Good news for Xiaomi Redmi Note 6 Pro users, Android Pie update for Redmi Note 6 Pro starts rolling out. The update is available for all variants as a Global Beta ROM 9.3.21 and brings all Android Pie features. 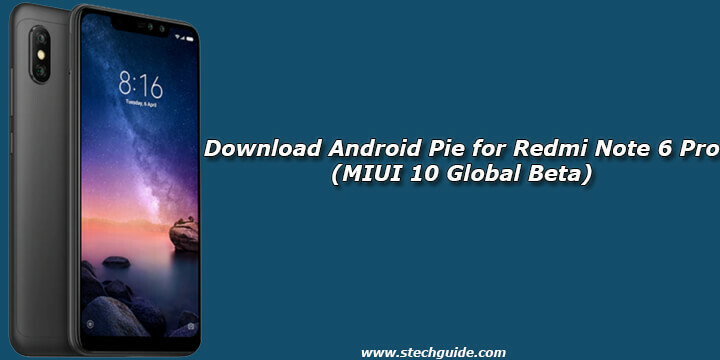 If you want early Pie access on your device, then download MIUI 10 Global Beta ROM 9.3.21 for Redmi Note 6 Pro from below. You need to follow the guide to Download Android Pie for Redmi Note 6 Pro. There is two method to get Android Pie on your device either install Android Pie OTA Updates or Download the Android Pie OTA for Redmi Note 6 Pro and flash it manually. If you want to install it via OTA then you have to wait for more time and if you want to install it manually then download Global Beta ROM 9.3.21 for Redmi Note 6 Pro from below. Download Android 9 Pie for Redmi Note 6 Pro from below. This method will work only on Xiaomi Redmi Note 6 Pro. The ROM can be flashed via Stock as well as TWRP Recovery. To install Android 9 Pie on Redmi Note 6 Pro download either Recovery ROM or Fastboot ROM from above and use the below method to install this on your device. This is the easiest way to Install Android Pie on Redmi Note 6 Pro (Global Beta ROM 9.3.21). Comment below if you have any doubts. Stay connected with us via Facebook, Twitter, and Google Plus to read more such helpful posts.